Playing with confidence is often the difference between success and failure. For members of the Crooked Tree Gov’t School Girls Softball Team everything just feels right. Hitting the ball and making plays seems simple and stress-less. In Crooked Tree Village, softball is still a great spectator sport and the “Girls” team has a lot of great fans. Principal Verla Jex of the Crooked Tree Government School said she is very excited about her girls’ team outstanding performance in the Belize District Rural Primary School Softball Competition. “Our girls need to know when they have achieved a set of goals, so that they can remain engaged and enthusiastic”. 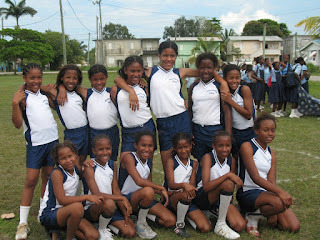 On Wednesday, March 18, 2009 the team won overwhelmingly by beating three of the best teams in rural Belize. They ousted “Burrell Boom” 13-3, demolished “Ladyville” 13-2 and blew “La Democracia” completely away 16-nil. This Wednesday, March 25, 2009 they will take the competition to Rogers Stadium in Belize City to face the Belize City teams for District Championship. Principal Jex is confident that her girls have a good chance of winning because they are very courageous. Coach Alden Wade and Anna Marie Gillett said that they teach the girls drills and skills to motivate and inspire. The team also gets valuable team work and life lessons from the assistant principal, Winnie Gillett and teacher George Tillett. Crooked Tree School also has a boys’ team, but they did not fare off as well as the girls; they were eliminated from the qualifying game. Principal Jex said that many of the families cannot afford the uniform needed for the children to participate in the games and as a result, the boys’ team has to play without their uniforms. “We have been very fortunate to have the girls’ uniform donated by Michael and Angela Crawford Webb of the Crooked Tree Village Resort”. If anyone would like to contribute to the teams, you can e-mail her at- verlajex@yahoo.com. The cost of uniforms for a full team is BZ$1000 or US$500. Your contributions would be very much appreciated. I am proud of our girls! Love your vision for the village especially it's youths.